Christians have always believed that the death of Jesus had far-reaching consequences, and have tried various ways of explaining how that was achieved. Modern science provides a rich sources of ideas that can be used alongside more traditional theories. I want to suggest here that photosynthesis provides a helpful metaphor for what Jesus did at his crucifixion. Photosynthesis is the process by which plants convert light energy into energy that they can be use, and it involves absorbing carbon dioxide from the environment and emitting oxygen. Many people are familiar with it from school biology. Some of the early research on photosynthesis was carried out by Joseph Priestley. He found that if a candle was lit in an airtight container the flame soon extinguished, and a mouse died if put in an airtight container in which a candle had burned out. However, he also found that mouse was able to live if a plant was placed inside the airtight container. Putting a sprig of mint and other plants in an airtight jar in which a candle had burned out restored the “injured” air enabling the mouse to live. The plant absorbed carbon dioxide and released oxygen, enabling the mouse to live. My analogy is that the moral and spiritual air that humans breath has become injured by too much fear and hatred being released into it. That injures the atmosphere in a way that is analogous to how carbon dioxide injures it. If nothing is done to restore the atmosphere, animal life becomes impossible. 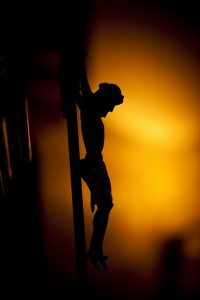 Just as plants absorb the carbon dioxide that poisons the atmosphere, and release the oxygen that restores it, so I suggest that what Jesus does on the cross is to absorb the huge fear and hatred that was misdirected towards him, resulting in his crucifixion; he converts it into love and compassion that heals the moral and spiritual atmosphere. Jesus is like the sprig of mint in Priestley’s experiment that healed the injured atmosphere and enabled the mouse to live. He was able to do this because of his extraordinary capacity to absorb fear and hatred without feeling fear and hatred himself in response. It provides a model for how other people can try to heal the injured moral and spiritual atmosphere around them. Such analogies are never exact, but I think science provides a useful source of analogies that help to make sense of Christian belief, and that photosynthesis provides a helpful extra way of thinking about how good came from Jesus crucifixion.